I am an electrical engineer and have a Trotter 525. I want to install a magnetic or rip cord switch to the treadmill to ensure my son who has had an head injury doing physio is safe. Do you sell the switch and cord? I can then drill, install and wire it up. On the back of the console there is a small piece of metal, usually glued (which keeps the safety key in place) and a sensor (also glued) which opens and closes a 2 pin circuit. There is no need to drill the console to install this. The sensor has a wire of about 100 cm length, which goes down the treadmill posts to the motor compartment. Down there you usually find a controller board which gets the sensor signal, if it's open, it stops the motor power or doesn't allow it to start. 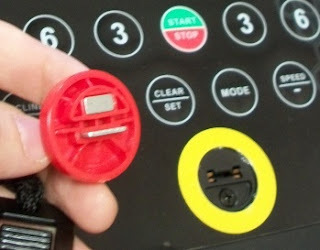 If there is no key on your treadmill (looks an old model), you could make a switch yourself so that the sensor controls the switch below and cuts the current in case the safety key is removed. Is that what are you looking for? If the situation is not so bad, that could be good, but please note that there are on the market specific treadmills aimed at rehabilitation which have additional safety features (such as reduced speed, long handrails, automatic-speed setting, etc. ), which can lower risks more than the use of the safety key which is designed for people in good physical standing.